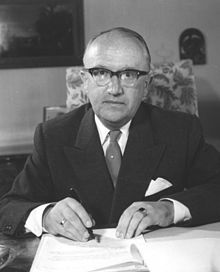 The Hallstein Doctrine, named after Walter Hallstein, was a key principle in the foreign policy of the Federal Republic of Germany (West Germany) from 1955 to 1970. As usually presented, it prescribed that the Federal Republic would not establish or maintain diplomatic relations with any state that recognized the German Democratic Republic (East Germany). In fact it was more nuanced. There was no public official text of the "doctrine", but its main architect, Wilhelm Grewe, explained it publicly in a radio interview. Konrad Adenauer, who served as Chancellor of Germany from 1949 to 1963, explained the outlines of the policy in a statement to the German parliament on 22 September 1955. It meant that the Federal German government would regard it as an unfriendly act (acte peu amical) if third countries were to recognize the "German Democratic Republic" (East Germany) or to maintain diplomatic relations with it – with the exception of the Soviet Union (as one of the Four Powers responsible for Germany). :58–61 The West German response to such could mean breaking off diplomatic relations, though this was not stated as an automatic response under the policy and in fact remained the ultima ratio (last resort). The Federal Republic abandoned important aspects of the doctrine after 1970 when it became difficult to maintain, and the Federal government changed its politics towards the German Democratic Republic. :19 The Four Power Agreement on Berlin in 1971 and the signing of the Basic Treaty in 1972 brought an end to the doctrine, in accordance with the new strategy of Ostpolitik. Following Germany's defeat in World War II, the territory east of the Oder–Neisse line was under Soviet or Polish administration and had de facto been annexed. The rest of the territory west of that was divided into four occupation zones controlled by the Allies, with the former capital, Berlin, being similarly divided into four sectors. In 1969 Willy Brandt became German Chancellor as head of a social democrat / liberal government. The new government maintained the main political goals such as the German reunification in peace and freedom, but it altered the way to achieve these goals. Brandt's new Ostpolitik was a policy of negotiating with the German Democratic Republic government in order to improve the situation of Germans in German Democratic Republic and involved supporting visits from one part of Germany to the other. As part of this, the Federal Republic de jure recognized the German Democratic Republic as a state organisation of parts of Germany not within the Federal Republic, emphasizing that both German states could not be "foreign" to each other, that their relationships can be only of a special kind. The Four Power Agreement on Berlin in 1971 and the signing of the Basic Treaty in 1972 brought an end to the doctrine, in accordance with the new strategy of Ostpolitik. In diplomacy the non-recognition of another state, and the discouraging of third states to do the same, is an old instrument. In the first years after the establishing of the communist Soviet Union and People's Republic of China, the United States refused to have diplomatic contact with them. Similar exclusive mandate policies (One-China policy) were (and still are) pursued by the People's Republic of China and Republic of China (Taiwan), and the situation in Vietnam during the Vietnam War was somewhat similar. In 2016, Torben Gülstorff gave a new interpretation of the Hallstein doctrine. According to him, the doctrine’s impact on the West and the East German foreign policy was only marginal, more myth than reality. During the entire Cold War, national economic and international geostrategic interests dominated German foreign affairs – on both sides of the wall. ^ a b Hans Wendt, Editor of the Nordwestdeutscher Rundfunk. "Interview des Ministerialdirektors, Professor Dr. Wilhelm G. Grewe mit dem Chefredakteur des Nordwestdeutschen Rundfunk, Hans Wendt ["Hallstein-Doktrin"], 11. Dezember 1955: Einführung" [Interview with Professor Wilhelm Grewe [Head of the Political Dept. of the Foreign Office of the Federal Republic of Germany ]on 11 December 1955: Introduction]. 100(0) Schlüsseldokumente zur deutschen Geschichte im 20. Jahrhundert [100(0) key documents on German history of the 2oth century (in German). Bavarian State Library. Retrieved 2011-09-13. ^ a b c Grewe, Wilhelm G (1995). "Hallsteins deutschlandpolitische Konzeption" [Hallsteins deutschlandpolitische Konzeption]. In Loth, Wolfgang; Wallace, William; Wessels, Wolfgang (eds.). Walter Hallstein: Der vergessene Europäer? [Walter Hallstein: The forgotten European?]. Europäische Schriften (in German). 73. Forewords by Helmut Kohl and Jacques Delors. Bonn: Europa Union Verlag. pp. 57–79. ISBN 3-7713-0499-7.
also available in translation in Loth, Wilfried; Wallace, William; Wessels, Wolfgang (1998). Walter Hallstein: The Forgotten European?. New York: St. Martin's Press. ISBN 978-0-312-21293-3. ^ a b c d e f g h i j k l m n o p q r s t u v w x y Kilian, Werner. Die Hallstein-Doktrin. Der diplomatische Krieg zwischen der BRD und der DDR 1955–1973. Aus den Akten der beiden deutschen Außenministerien [The Hallstein Doctrine. The diplomatic war between the FRG and the German Democratic Republic 1955–1973. From the files of the two German foreign ministries]. Zeitgeschichtliche Forschngen (in German). 7. Berlin: Duncker & Humblot. ISBN 3-428-10371-8. ISSN 1438-2326. ^ a b Spencer, Robert (1995). "The Origins of the Federal Republic of Germany, 1944–1949". In Schweitzer, Carl Christoph (ed.). Politics and Government in Germany, 1944-1994: Basic Documents (2nd ed.). 9781571818553. pp. 1–28. ISBN 9781571818553. ^ "Grundgesetz für die Bundesrepublik Deutschland vom 23. Mai 1949". Retrieved 2011-10-30. ^ Lahn, Lothar (1995). "Walter Hallstein als Staatssekretär" [Walter Hallstein as state secretary]. In Loth, Wolfgang; Wallace, William; Wessels, Wolfgang (eds.). Walter Hallstein: Der vergessene Europäer? [Walter Hallstein: The forgotten European?]. Europäische Schriften (in German). 73. Forewords by Helmut Kohl and Jacques Delors. Bonn: Europa Union Verlag. pp. 31–48. ISBN 3-7713-0499-7. ^ Kilian, Michael. "Walter Hallstein: Jurist und Europäer" [Walter Hallstein: Jurist und European]. Jahrbuch des öffentlichen Rechts der Gegenwart. New series (in German). Tübingen: Mohr Siebeck. 53, 2005: 369–389. ISSN 0075-2517. ^ Wilhelm Grewe (interviewee), Archiv für Christlich-Demokratische Politik der Konrad-Adenauer-Stiftung, Sankt Augustin (prod.) (1987). The resumption of diplomatic relations between the FRG and the USSR and the Hallstein Doctrine (1955) (Flash) (video) (in German). Centre virtuel de la connaissance sur l'Europe (published 2011-08-15). Event occurs at 04:09. Retrieved 2013-03-09. ^ Jaenicke, Joachim (1995). "Erinnerungen an Walter Hallstein" [Memories of Walter Hallstein]. In Loth, Wolfgang; Wallace, William; Wessels, Wolfgang (eds.). Walter Hallstein: Der vergessene Europäer? [Walter Hallstein: The forgotten European?]. Europäische Schriften (in German). 73. Forewords by Helmut Kohl and Jacques Delors. Bonn: Europa Union Verlag. pp. 49–55. ISBN 3-7713-0499-7. ^ William Glenn Gray (2003). Germany's Cold War: The Global Campaign to Isolate East Germany. University of North Carolina Press. ISBN 0-8078-2758-4. ^ a b c Quoted in a German Constitutional Court decision, translation available at "Case: BVerfGE 77, 137 2 BvR 373/83 Teso-Beschluß German Democratic Republic-Citizenship". Institute for Transnational Law, University of Texas at Austin. Retrieved 11 November 2007. .
^ Gülstorff, Torben (2016). Trade follows Hallstein? Deutsche Aktivitäten im zentralafrikanischen Raum des 'Second Scramble' (PDF). Berlin: Humboldt Universität. ^ Gülstorff, Torben (2018). "Die Hallstein-Doktrin – Abschied von einem Mythos". Deutschland Archiv. 2017: 177–190. ^ Gülstorff, Torben (2017). "Between Economic Interests and Cold War Motives: German Activities in the Central African Region During the Second Scramble for Africa" in Békés, Csaba, Melinda Kamár (eds.). Students on the Cold War. New Findings and Interpretations. Budapest: Cold War History Research Center, 212–234. ^ Gülstorff, Torben (1 August 2018). "On Both Sides of the Berlin Wall: Africa and the Two Germanies". Review of African Political Economy Online Blog. ^ Gülstorff, Torben (2017). "Klassenkampf um neue Märkte: Das verkannte ökonomische Primat ostdeutscher Außenpolitik am Beispiel Zentralafrikas". Zeitschrift des Forschungsverbundes SED-Staat. 41: 103–114. This page was last edited on 9 April 2019, at 01:01 (UTC).